This gold-foiled set lets you say “cheers” four different ways: Prost, Sante, Chin Chin and Cheers. With modern style and timeless class, the 8 oz. 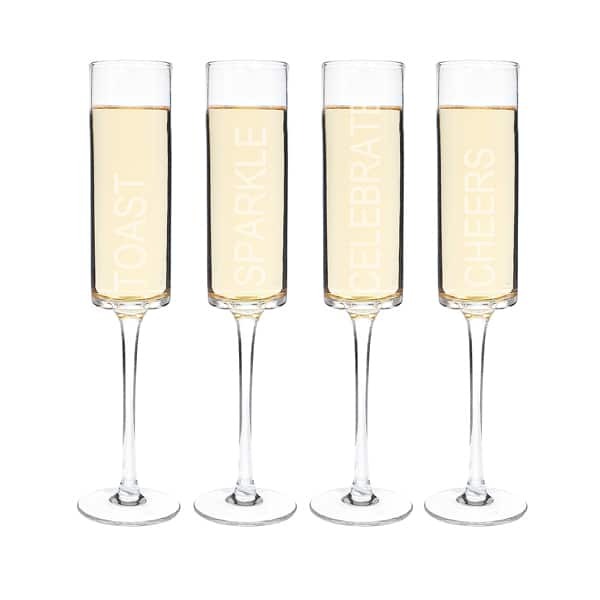 Gold “Cheers” Contemporary Champagne Flutes turn any drink into a memorable toast. Cheers with family and friends as the gold script on the bell-shaped flutes would propose. A custom gift box seals the deal with these enchanting flutes. Give them as gift or indulge in the luxury yourself. Closeout item! This item will be discontinued when our existing inventory runs out. Order soon! Includes (4) contemporary champagne flutes + presentation box. Flutes measure 10.4” H. with a 1.94” diameter, and a 2.75” base (diameter). each. Presentation box measures 3” W. x 13.75” L. x 12” H.